1/14/2011: You can’t keep a good moss down! 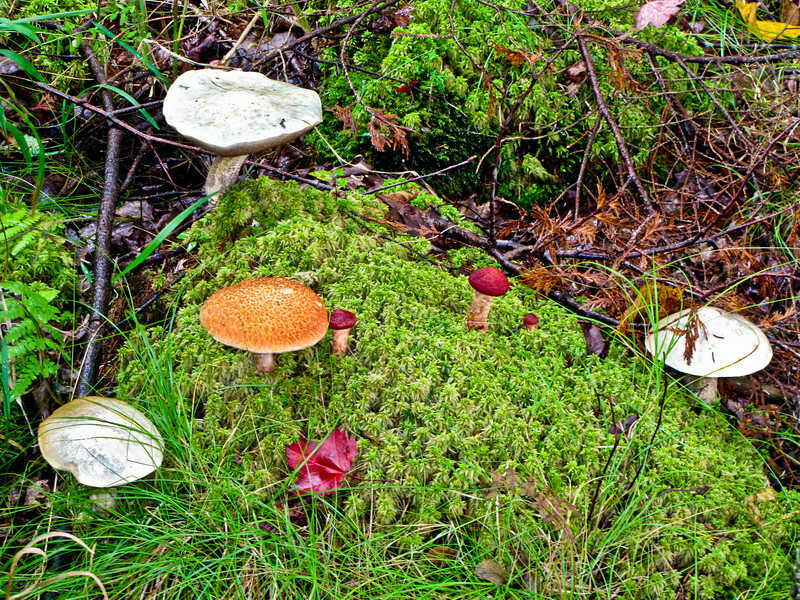 The boggy fir forest that surrounds Saco Heath is always an interesting place. The water there must be on the warm side, perhaps from the peat decomposition, because despite several inches of snow covering the forest floor, there were these little bare patches of moist moss showing in odd spots. 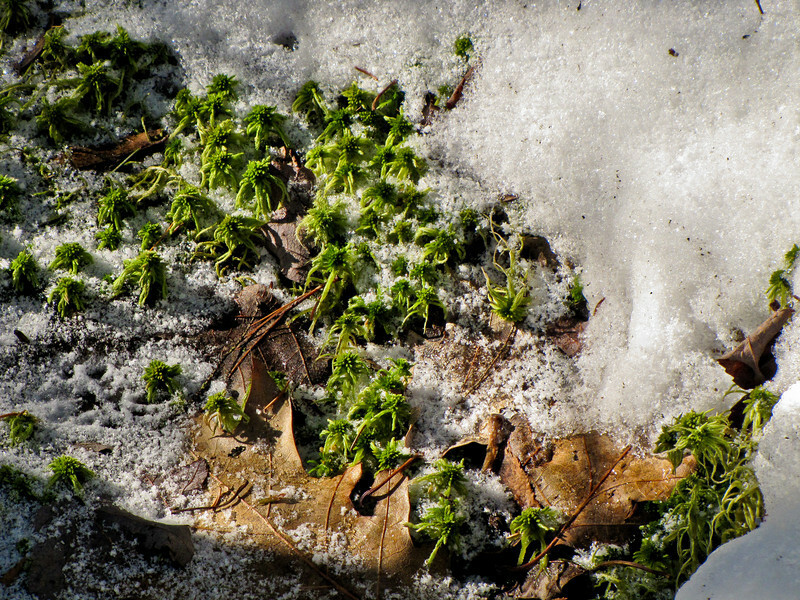 The contrast of bright green with the snow and old oak leaves is what caught my eye here. Then it was just a matter of framing it. Canon SX20IS at 360mm equivalent, f5 @ 1/400th @ ISO 160. Snow Mode. 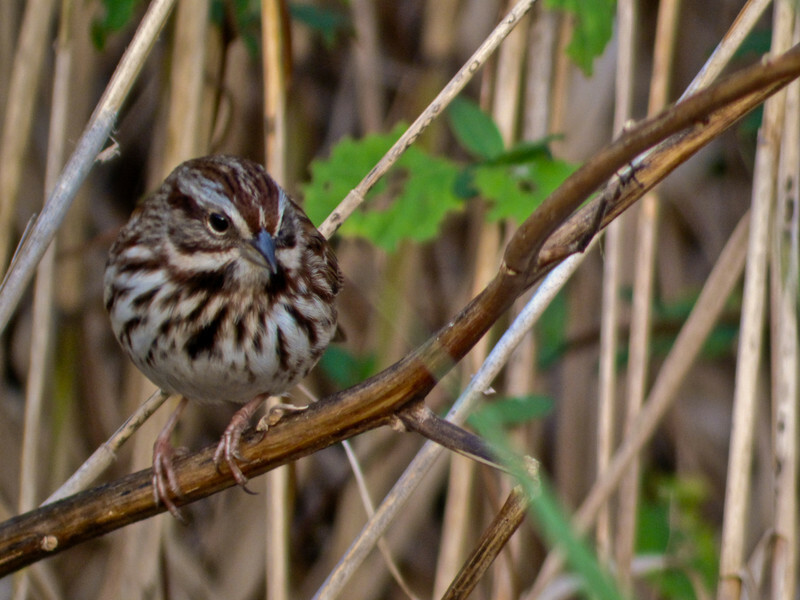 Another from our short visit to Saco Heath last Sunday. 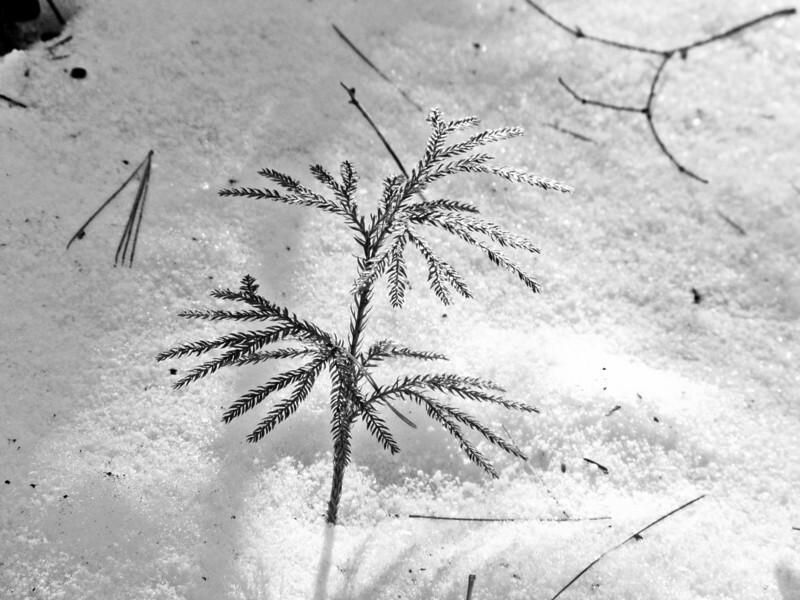 We always called this trailing pine, but a look to Google identifies it as Ground Pine, a clubmoss, and a member of the fern family. It has a long horizontal growth below ground, and sends up these vertical branches every 6 to 12 inches. Here a single vertical is isolated against the snow. I have put the B&W version first today, but this is another case where I am not certain which one I like best. The B&W is processed in Lightroom, using the B&W Look 3 filter. The B&W emphasizes, of course, form. The color plays on contrast. I like them both, but in this case I lean toward the color version. Color processed in Lightroom for intensity and clarity. Canon SX20IS at about 400mm equivalent, f5.0 @ 1/200th @ ISO 200. Snow Mode. 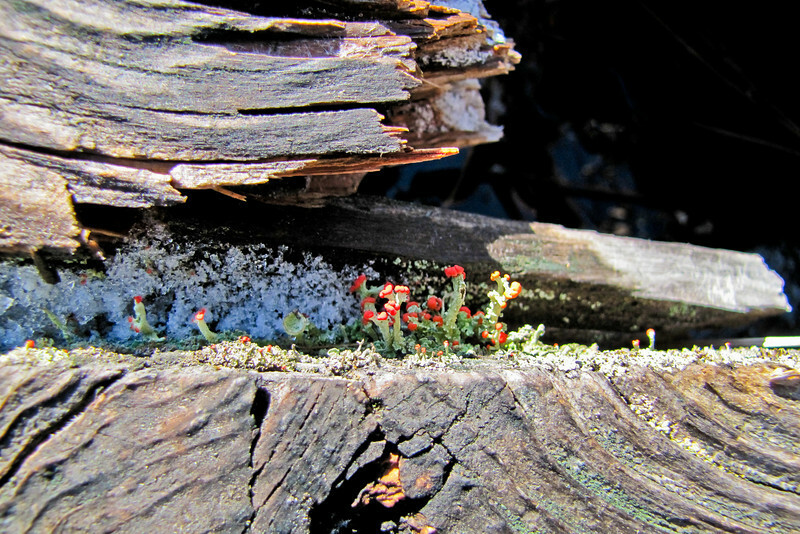 Certainly this is the only plant flowering in January at Saco Heath, and you have to look down in the cracks between the broken boards of the boardwalk to find it. Not that it is hard to find. That red really stands out, especially against the dusting of snow down there in the crack. Canon SX20IS at 28mm equivalent and Super Macro, f2.8 @ 1/400th @ ISO 160, Programmed auto. Emmon’s Preserve is a little slice of riverside (brookside in most seasons) preserved by the Kennebunkport Land Trust. I have posted pics from there in the past, as it is one of the rare little parcels of forest and stream in Southern Maine with public access. And a nice little parcel it is too. 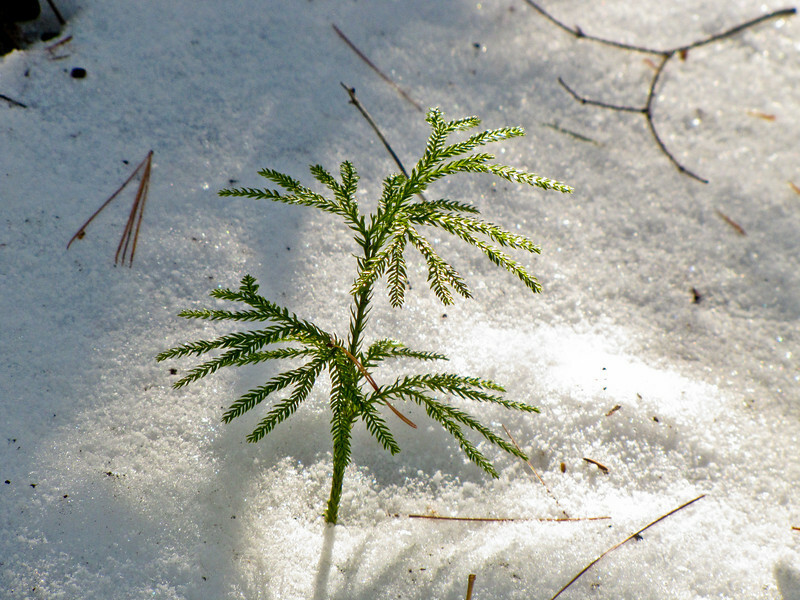 This is on the trail in from the road to the stream a week after our December blizzard. Others had been before me with snowshoes and skis, so, despite standing snow on all sides and drifts that had certainly closed the trail, it was a pleasant hike, even in boots. 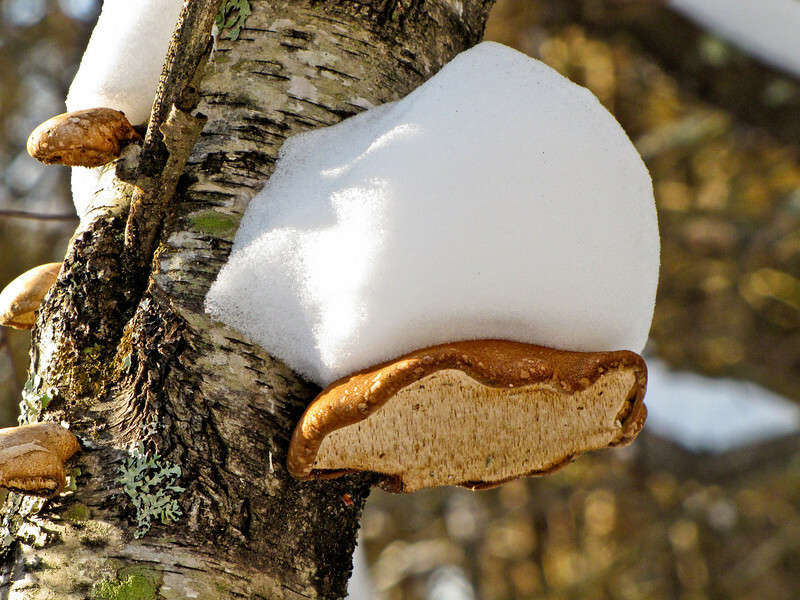 For this shot I used the flip out lcd on the Canon SX20IS to get low and shoot up under the fungus on side of the birch, since it was the contrast between the texture of the growth and the snow-cap that interested me, both set against the textures and colors of the trunk with its patches of lichen, and then the shapes of all three. Canon SX20IS at 280mm equivalent, f5 @ 1/200th @ ISO 200. Snow Mode. 11/7/2010: in the frame now, happy Sunday! I woke this Sunday morning from a dream of worship…that in itself is odd…though I do have a few of those dreams each year, and I suppose Sunday morning is appropriate for one…but before I was fully awake this post formed, and now, up and at the computer, all I have to do is build what I saw. At my best as a photographer I am only a frame and an instant. I am a frame. All I do is point the frame of the camera’s rectangular view at the world. Today I use the zoom on the camera to change the size of the frame…make it bigger and more inclusive, more grand…or smaller and more particular, more intimate. I can move in close for a true macro of lichen, or add magnification by shooting through a spotting scope for portraits of sparrows. 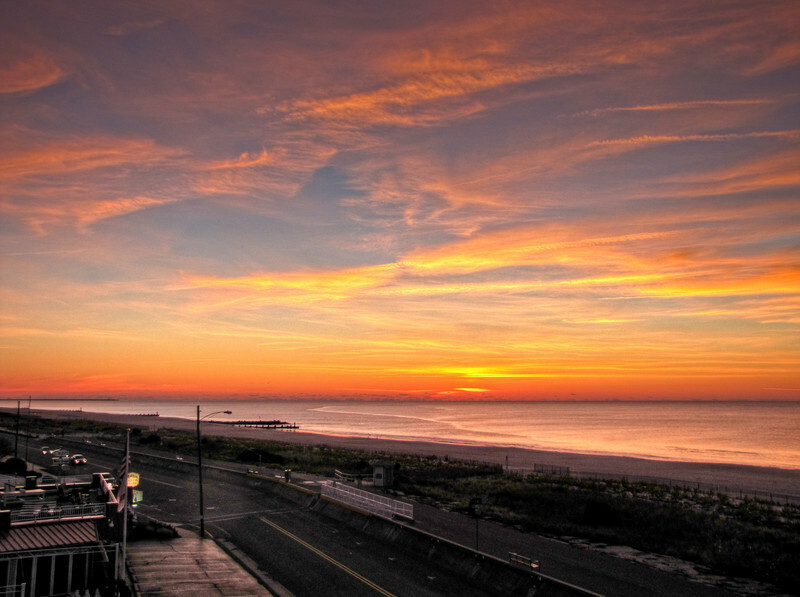 I can zoom out to wide-angle for the sunrise. I can even stitch frames together into the larger frame of a panorama. But whatever I do, it is still a frame…a little rectangle imposed on reality. The frame says “This is what I see. Look!” I am a frame. I am an instant. I control when I push the shutter button. I choose the instant, and it is only an instant…a fraction of a second, when the camera records, for better or worse, whatever is in the frame. Even if I shoot a burst of images, as I often do when digiscoping birds, I still have to pick the one instant out of all those instants that I want to show the world. The instant says “This is what I see now. Look” I am an instant. I do not fill the frame, I can only point it. I do not create the instant. I can only choose it. But in those two choices is all the power of photography. The rest is just technique. This is what I see now. Look! I don’t of course, know what you see when you look at one of my photographs. I can hope that if I have done my job, you will see something that captures your attention…maybe even something that stirs your soul, that moves within you and touches places that need touching. At best, looking at what I see might open your eyes to something you would not otherwise have seen. It might change the way you see the world. That is the power of photography at its best. I took pictures for a long time before I knew what I was looking for…what fills my frames and draws me to the instants I choose. Interestingly enough, the actual photographs did not change much, if at all. One day I knew why as well as what and when. And that brings us full circle. As I have said, I am sure, on more than one Sunday in the past, my why is worship. What fills my frame in the ever-changing now is always some aspect of the beauty…the awe-full beauty, the intimate splendor, the wonderful power, the amazing compassion…of the Creator God displayed in the creation. Every picture is a celebration of that in God and that in me that brings the world to being through love. I frame those instants, from macro to panorama, when I am most aware of God. That is worship. That is my why. So, this is what I see, now. Look. 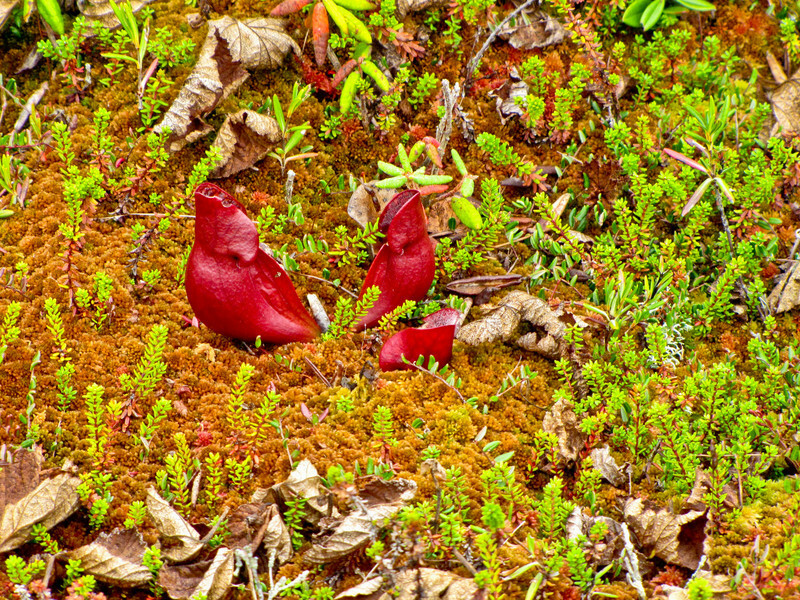 As I said yesterday, the peat bog at Quoddy Head State Park is a vibrant habitat. 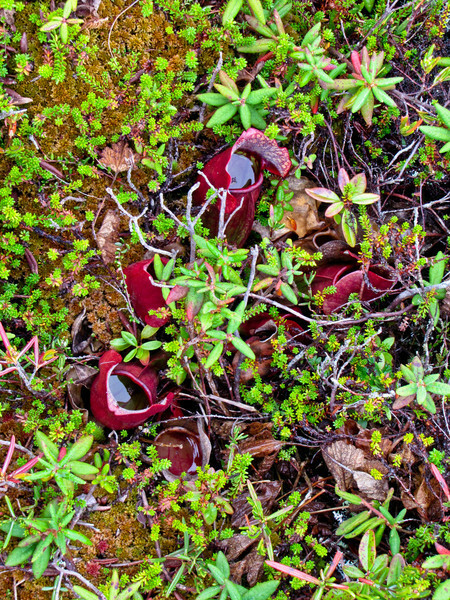 I don’t know how it looks in spring or summer, but in fall, the dense mix of mosses and lichens, in shades of red and green (and even white) form a rich carpet, dotted with an amazing abundance of pitcher plants, most of which in this season are deep red or even purple. The closer you look the more inspiring it becomes. The contrasts of color and texture and form, and the variety packed into every square foot, are, to my eye, wonderfully beautiful. It makes me want, as few habitats to, to study…to find out what all these plants are and how they are related. 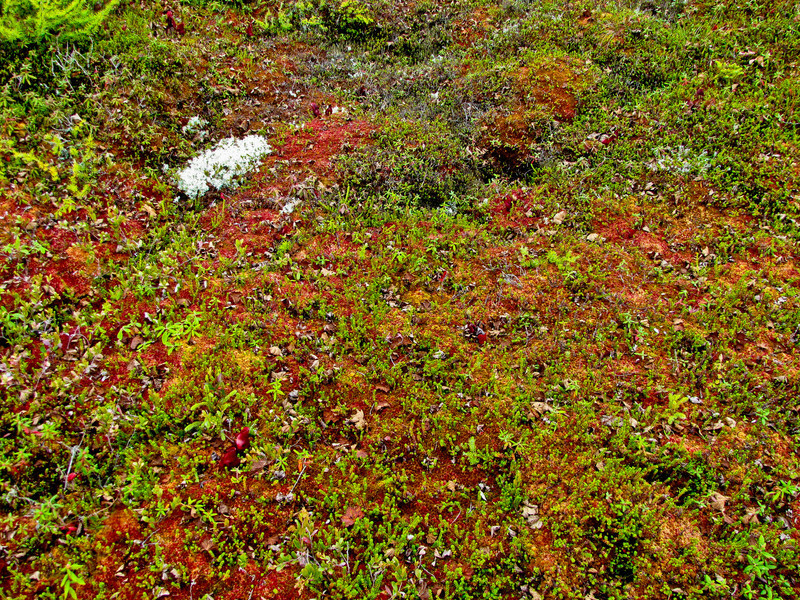 The carpet of the bog is so alive…I want to know how it works. There has to be a fascinating story in anything so intricate and so beautiful. And, of course (being Sunday), while there is certainly a science that makes up the story, for me it will always be the story of a Creator from whom I inherit the eye and the heart that can appreciate such intricate beauty: that can stand in awe and respond in worship. This is the kind of environment and the kind of work that brings out the best in the Canon SX20IS. This set of shots runs from one end of the macro zoom range to the other; several would have been very difficult, shooting from the narrow boardwalk, without the lip out LCD viewer; and the detail shots, in the dim light of foggy day, are all at an impressive ISO 200. And I can fully appreciate the beauty in Canon’s accomplishment as well. 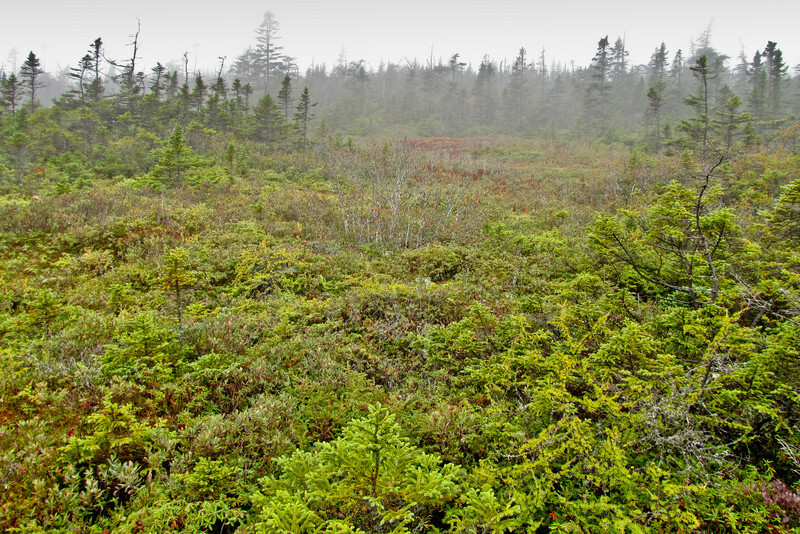 Of course, I do plan a trip back to Quoddy Head in the spring to see what the peat bog looks like then! 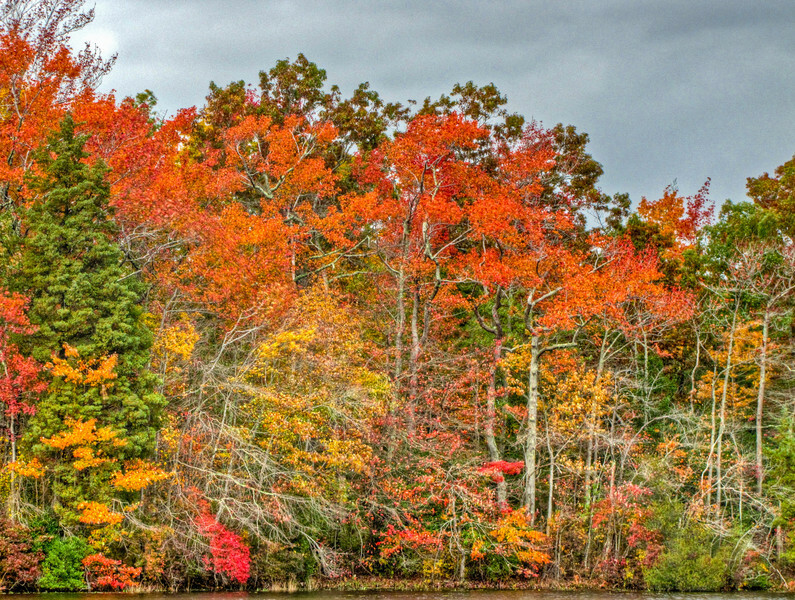 Saco Heath is one of my favorite photographic destinations in Southern Maine. I have used several images from there as Pic of the Days and I have a gallery on Wide Eyed In Wonder dedicated to it. Saco Heath is a remnant peat bog…the southern-most in Maine, and, as such, provides a sample of an environment that I would otherwise not have access to. 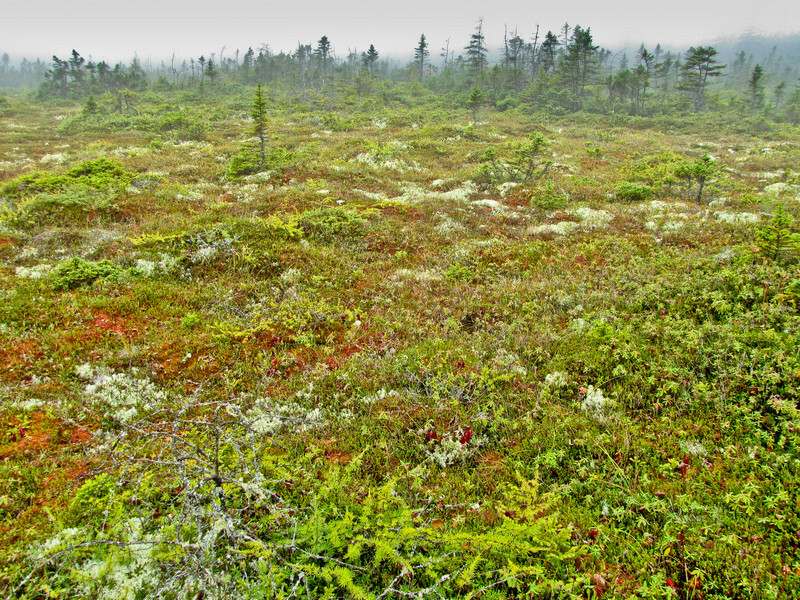 While at Quoddy Head State Park last Saturday, I visited their peat bog…tiny compared to Saco Heath, but totally, awesomely alive. It is obvious, having seen the bog at Quoddy Head, how the bog at Saco Heath struggles for survival. 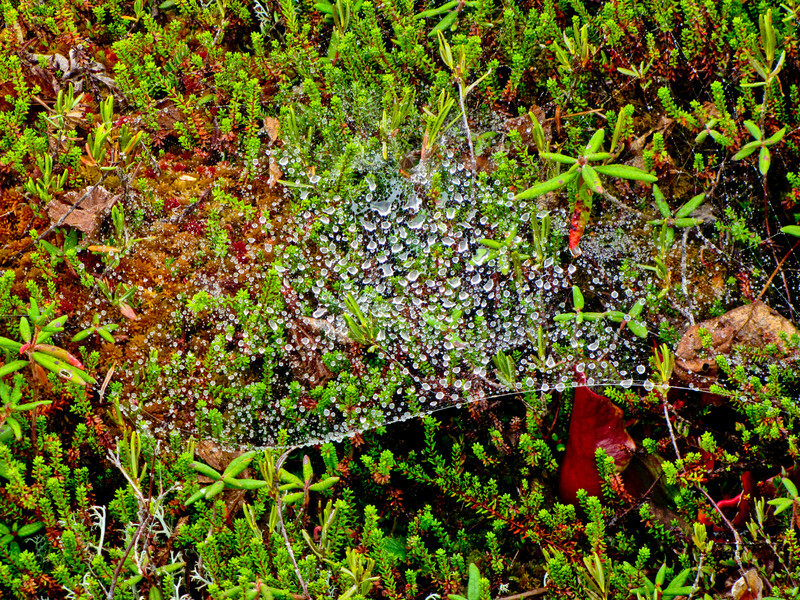 Even in the fog, and even as fall comes on, the Quoddy bog is vibrant and beautiful. 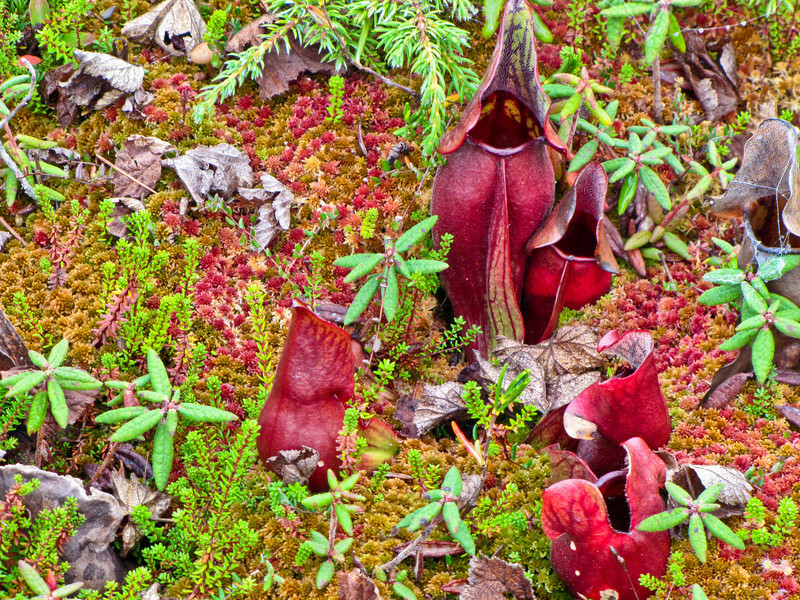 At a guess I would say there are more pitcher plants in a 3 yard square of Quoddy than there are in all of Saco. And the variety of mosses and lichens and stunted trees is simply amazing. Truly a beautiful little gem of a bog! For today I preset the bog in the wide view. Tomorrow you will see some of the detail. The top shot shows a section where the moss still rules, and the second shot, from the back edge of the bog, shows how the trees have pushed out into the bog, where they live a life in miniature. The fog, in both cases, and imho, only adds to the atmosphere of the place. Canon SX20IS at 28mm equivalent. Both at f4.0 @ 1/100th @ ISO 80 and Landscape program. Recovery in Lightroom for the overexposed fog, some Fill Light and Blackpoint right, added Clarity and Vibrance, and Sharpen narrow edges preset. Since the fog in the distance was completely white and somewhat distracting, I used a Graduated Filter effect on both images to darken the sky, which had the added benefit of making the fog more transparent.